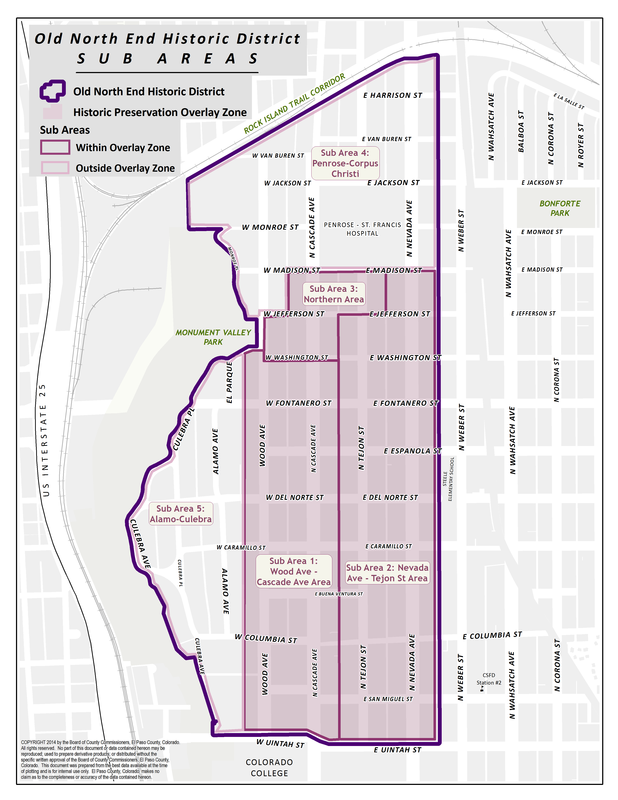 The Old North End National Register Historic District Sub Areas 1, 2 and 3 are under the protection of the City’s Historic Preservation Ordinance as this district is zoned “The Historic Preservation Overlay Zone (HPOZ)”. See details of overlay zoning and this ordinance by clicking Here. Note: the HPOZ does not include Sub Area 4 Penrose-Corpus Christi or Sub Area 5 Alamo-Culebra. Click Here for a map of the five Sub Areas. Colorado Springs Historic Preservation may be found by clicking Here. City Contact for Historic Preservation is Chris Staley, Planning & Development Land Use Review at (719) 385-5090 or by e-mail at cstaley@springsgov.com. If your house is located in this district and you intend to make changes to the outside of the structure for which a building permit is required, your proposal must be reviewed for conformance to City Council-approved design standards (click Here ) by the City’s Historic Preservation Board. One page basic information summary about permits from Pikes Peak Regional Building Department (RBD). May 2012 issue of CAN We Talk from RBD describing those projects that require a permit and those that do not. Click Here for the article. If a permit is required for your project be sure the contractor you choose is licensed and registered at the RBD. Click Here to see. Re-roof permits are able to be reviewed administratively by staff at the Development Review Enterprise (DRE). Click Here for re-roof Report of Acceptability form. All other projects must be reviewed to determine if they need to be reviewed by the Historic Preservation Board to ensure compliance with the North End Historic Preservation Design Standards. Click Here for the Report of Acceptability application form. Siding and roofing replacement requires a permit unless the area of replacement/repair is less than 100 sq ft. Adding chimney liners for gas insert, boiler etc. require a permit and may result in exterior changes to the chimney such as caps or other chimney coverings but those do not require Historic Preservation Ordinance review/approval. Window replacement does not require a permit unless the opening is being enlarged or reduced in size or a window is added where none existed before. Request for a variance is a separate issue. Click Here for more information.